Now that it is Summer time, it is time to start thinking about Summer fruits and vegetables. There are many factors that determine the nutrient density of fruits and vegetables. These include whether or not it is organic, when it was picked, its color, ANDI Score, sugar content, soil quality, whether or not it is part of the cruciferous family, its oxalate content, and more. I will also be talking about how much you should consume and what types. By making better choices with your produce, you can really increase the nutrients in your diet. These are all the things you should take into consideration. 1. Choose Organic Produce. You should buy organic fruits and vegetables as much as you can. Fruits and vegetables that are not organic are usually sprayed with pesticides, are often genetically modified, and often have less nutrient rich soil which produces less nutrient dense produce. Some people cannot afford to buy everything organic. There are certain fruits and vegetables that typically do not attract as many pests and therefore do not have that many pesticides used on them. Produce with thick, heavy skins such as avocados and bananas typically do not have to be organic. Berries and lettuce are very porous and easily absorb pesticides that are difficult to wash off so these really have to be organic. Here is the list of what does and doesn’t have to be organic. Does not have to be organic. If you are not going to be buying everything organic, you should use a produce wash to remove pesticides and also mold. Keep in mind though that some pesticides are put in the water and go directly into the plant and can’t be washed off, but using a produce wash will get rid of a lot of it. You can simply fill a large bowl with water and add a tablespoon of apple cider vinegar to it, place the produce in the wash for 10 minutes or so, and rinse under cold water, or I recommend buying this product if you don’t want to use apple cider vinegar. 2. Choose Produce That was Picked within a Day or Two. I recommend buying your produce at a Farmer’s Market. When you buy your produce at a Farmer’s Market, it is usually picked within days and therefore is much more nutrient dense. When you buy produce in the supermarket, it can be sitting around for weeks or longer. Also, when you shop at the Farmer’s Market, you can get to know the farmers who are growing your food which can give you a better idea of the quality. I recommend talking to the vendors and farmers and asking the following questions. Where was this produce grown and was everything here grown at the same place? You want to verify it was grown at a local farm. Some vendors import produce from other countries and states and are really just a gloried supermarket passing themselves off as a local farmer’s market vendor. When was this produce picked? You want it to be within the last couple of days. The farm easily could be a couple of hours away and Farmer’s Markets typically start early so it might not be picked the same morning, although it could be. Is it organic? If not, do you use pesticides or chemicals? Some smaller farms practice organic farming methods but don’t have the organic label as it isn’t always easy to get, and they are often less expensive. How do you care for your soil? What type of seeds do you use and where do you get them from? By asking these questions, you can really get a good idea of how nutrient dense your produce is. Once you find vendors/farms you like, you can keep going back and then you don’t have to ask the same questions every week. Growing your own fruits and vegetables is a great way to be sure of its nutrient density. You can grow it organically, and if you fortify the soil, you can be sure of the soil quality, and you can pick it and eat it immediately. 3. Choose Some Cruciferous Vegetables. These contain many cancer preventing properties so those are very important to have in your diet as well. Cruciferous vegetables include broccoli, cauliflower, cabbage, brussel sprouts, and kale. For a complete list of cruciferous vegetables, click here. 4. Choose Produce in a Wide Variety of Colors. 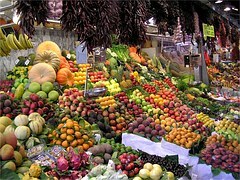 It is also important to include produce in a wide variety of colors in your diet. Red and orange fruits and vegetables usually contain high levels of vitamin C, green contain iron, blue, purple, and black colored fruits and vegetables contain antioxidants. The ones that are pigmented all the way through like blueberries and carrots tend to be more nutrient dense than something like eggplant which is purple on the outside and white on the inside. 5. Choose the Ones You Like. It sounds simple, but one of the most important criteria in choosing which fruits and vegetables to eat is simply to eat the ones you like the most. While nutrient density is important, all produce has nutrients, and you are more likely to actually eat the ones you really like. You will see that apples, for example, score very low on the ANDI score listed below, but if you really, really like them, I recommend keeping them in your diet. 6. Choose as Much Produce as You Can With a High ANDI Score. Another indicator of nutrient density is the ANDI score. ANDI stands for Aggregate Nutrient Density Index. The scoring system rates foods on a scale of 1 to 1000 based on its nutrient content and includes factors such as vitamins, minerals, micronutrients, antioxidant capacities and phytochemicals. 7. Choose Mostly Fruits That are Lower in Sugar. With fruit, you should choose a good variety with many of them being nutrient dense, but also the majority of them should be low in sugar. Low to Medium Sugar Fruits. Some of the fruits that are highest in sugar are as follows and should be consumed in moderation are listed below. 8. Choose Produce Low in Oxalates if You are Sensitive. Oxalates are naturally occurring substances that form sharp crystals and are found in certain plants and other foods. The majority of people do not have a problem with them. However, some people are sensitive to oxalates and there are many seemingly healthy types of produce that are very high in them such as spinach, beets, sweet potatoes, most berries, and citrus fruits. Oxalates can cause kidney stones, chronic pain, fatigue, muscle weakness, as well as many other health problems. To learn more about oxalates and the foods that contain them, click here. People who are sensitive to oxalates need to avoid these foods. If you think oxalates could be a problem for you, you can try avoiding them to see if your symptoms improve, or make an appointment with a Holistic Doctor or Functional Nutrition Practitioner such as myself or another Alternative Health Professional. How Many Servings of Fruits and Vegetables Do You Need to Eat? With fruits and vegetables, you really want to consume a variety. Different fruits and vegetables, particularly different colored ones, contain different nutrients. Don’t start consuming only leafy greens just because those are highest on the ANDI scale. Cruciferous vegetables do not score high on the ANDI scale but are critical as they contain many anti-cancer properties. Different people have different requirements, but a good general guideline that I recommend is consuming one and a half cups of produce, mostly vegetables, with each meal. I do not recommend having more than two servings of fruit per day as a lot of them are high in sugar. I recommend that one quarter of your produce should be leafy greens, one quarter should be cruciferous vegetables, one quarter should be darkly pigmented produce where the color goes all the way through the produce, and one quarter should be the ones you really, really like. Another way to determine your produce needs by using Metabolic Typing. Metabolic typing is a nutritional system based on each person’s unique biochemistry. Your dietary plan is based on which part of your nervous system is more dominant, parasympathetic or sympathetic, how your body oxidizes nutrients, and whether you are a protein type, carb type or a mixed type, and more. This can give you a better idea of the amount of produce and the exact types that are right for you personally. There is a fee to take this test but it is very low. You can check it out here. Another test that is a little more general, but still good, is this one and it is free. What did you learn about nutrition and health from reading this article? Are there any types of produce you would like to include in your diet that you don’t normally eat? What other types of posts would you like to see here? This is great! I love that you shared some of the most highly pesticide contaminated produce. So important! I love the questions that you shared to. So important to ask questions about your food and where it’s coming from and how it’s being grown. Thanks Emily. I just think it is important for people to know that even if they can’t afford to get everything organic, there are still way better and healthier choices they can make. Wow! This article is SO informative! I’ll be referring to this page in the future <3 It's important to know more about the foods we eat even if we do buy them at farmer's markets. Thanks for sharing! It definitely is good to ask a lot of questions at the Farmer’s Market. There are so many great farms with excellent choices and some vendors that are not so great, and not what they appear to be. It’s so true about the freshness. When I make sauerkraut it is night and day between fresh from the farmers market or store-bought. The juices come right out without pounding when it’s picked fresh and when it’s bought from the store I have to pound and pound. Even when both are organic! That is so interesting. I have noticed it as well. I don’t have to add water to sauerkraut when the cabbage is fresher, the juices just easily come right out of it. I’m thinking of attempting a paleo version of the Food Stamp Challenge. I’ll be for sure be referring back to this post to ensure I make good choices even when limited by budget. That is a great idea, the Paleo Food Stamp Challenge. There are so many good, nutrient dense produce choices that are not expensive. Please let me know how it goes. If it works out for you, maybe I will try it. I appreciate the list of low-sugar fruits, as I am cooking for my mother-in-law who is doing a ketogenic diet as part of her cancer therapy. We eat a really wide variety of fruits and veggies. And living in Southern California a lot is available organically and locally. Hi Daja, It really is amazing how much the sugar content in fruit varies. I am glad you found it helpful. I am in Northern California and it is incredible how many choices and abundance we have when it comes to produce in this state. I hope your mother in law gets better soon. We have a family friend that was able to beat cancer using a ketogenic diet and other alternative therapies. Such a comprehensive and informative post! Thank you for sharing. I am so happy it helped.